﻿Sometimes, missing things find their way home. Bruce Davidson’s East 100th Street disappeared from the Brandeis Library in 1973. It would not return for several decades. 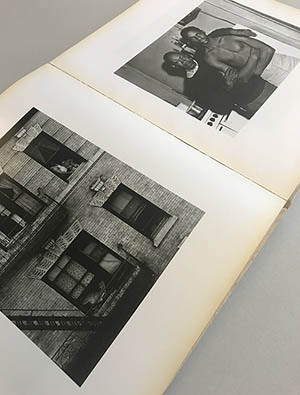 Presumed gone forever, the book was eventually replaced with another copy, and students and faculty continued to have access to the photographer’s striking black-and-white photography of a poverty-stricken block in East Harlem. Then one day in 2015, the book arrived back at the Library with a note from the former student who had held onto it for 42 years. “I am returning to you a book that I have had since 1973. While I have come across the book amongst my things many times, I have thought about it differently at different points in my life. As it lay carelessly strewn on a coffee table throughout the 70s, I’m pretty sure any inclination to return it was met with a misguided need to be an outlaw…to give expression to a rebellious impulse buried deep in my otherwise overly obedient, somewhat depressed, young self. In later years, coming across it would bring up feelings of guilt, followed by the decision to return it, followed by distraction and inaction. Now coming across the book, I feel shame and sadness. I see that it was given to the library as a gift in memory of a friend. I see that the images are powerful and could have influenced the perspective of the next person to pick it up off the library shelf. I see that books are precious, especially in the age of e-books and i-everything, and I did not keep this one in the best condition. I see that I had no business keeping it at all. East 100th Street is available in the Main Library Stacks.